Here is a list of wordpress eCommerce themes for your online store. These themes can give your online store a beautiful layout with all basic and advanced features that you need to get started. There are features like shopping cart, product page with zoom option, simple user account & many more features that you will love to have on your website. 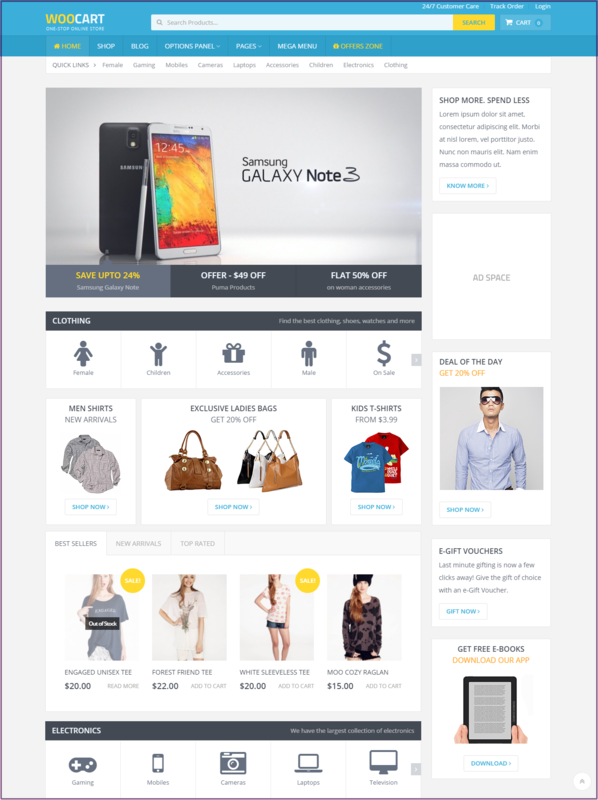 Woo Shop is a stunning E-commerce wordpress theme and it comes with responsive design. You will get the all advanced feature in theme that you need in an ecommerce theme. Things like customization, uploading products details, creating new pages, adding widgets and adding discount on products are really simple and quick with Woo Shop WordPress Ecommerce theme. 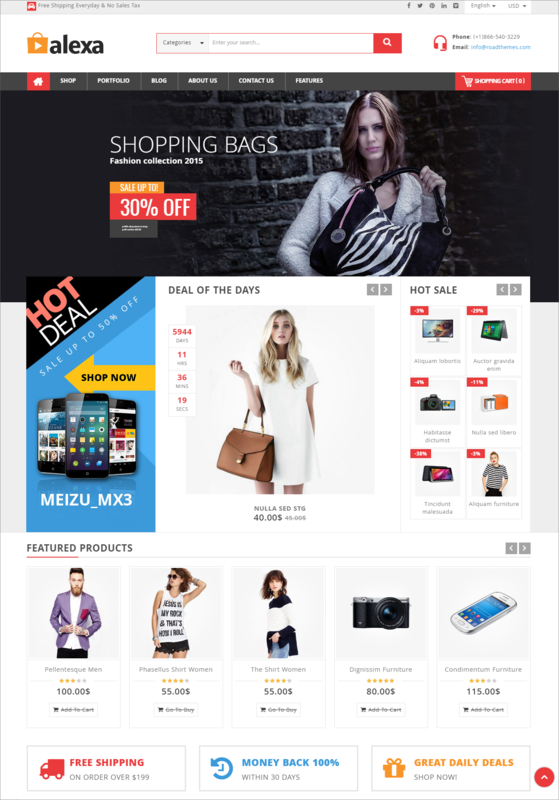 Perfect wordpress ecommerce theme by MyThemeShop comes with beautiful & responsive website design. Ecommerce wordpress theme helps you to increase sales. It comes with a option panel which allow you to make changes or modify your theme easily. Theme has features like quick view, wish list, product page, add to cart and many other amazing features that make an ecommerce website more effective and attractive. Wordpress Ecommerce themes has made this easy and quick to setup your online store. It just takes few minutes and you are ready to sell your product all over the world. Woo Cart is one of the best WordPress Premium Ecommerce Theme by MyThemeShop. Like all other ecommerce themes it comes with all advanced features. 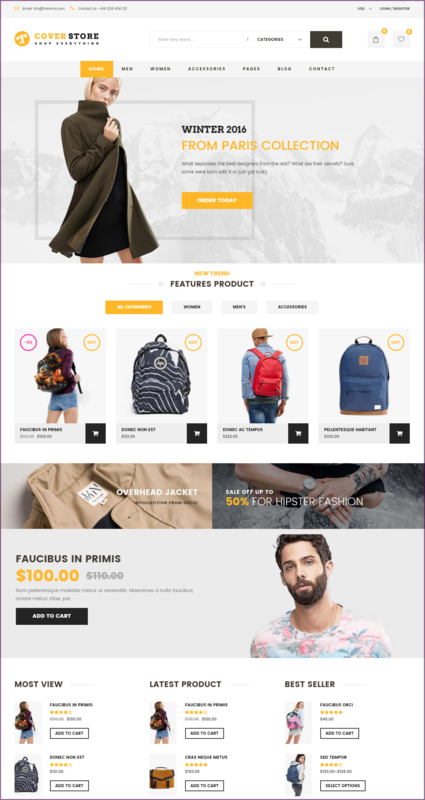 Theme has inbuilt blog design, Woo-commerce support, responsive design, step by step payment check out, home page product showcase slider, product slider and many more features that make this theme looks different than others. Fully responsive and multipurpose WordPress Ecommerce Theme with awesome pack of features. ChocoMars ecommerce template comes with beautiful home page layout and some really effective features. Theme has filter for products page to help visitors in finding best product for them. Theme customization is same as other wordpress ecommerce templates has, don’t require coding skills. It’s really simple and fast with theme option panel. 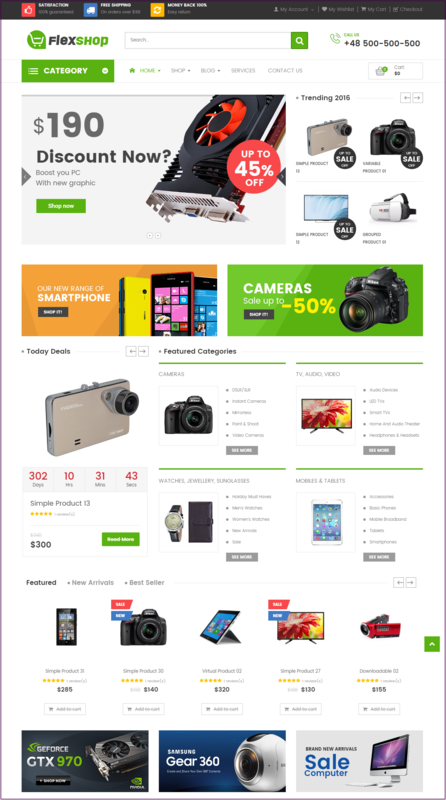 VG Flexshop Responsive WordPress Ecommerce Theme specifically designed for selling electronics, mobile devices and other tech products. Theme is fully responsive which means it works on different resolution devices. VG Flexshop is a flexible theme from option panel you can easily change the layout of the home-page. Also you can check out the changes at the same time in theme customization before saving changes. You will get all advanced features in the theme. Theme has product comparisons list feature which compare different product and shows the best product to the visitors. 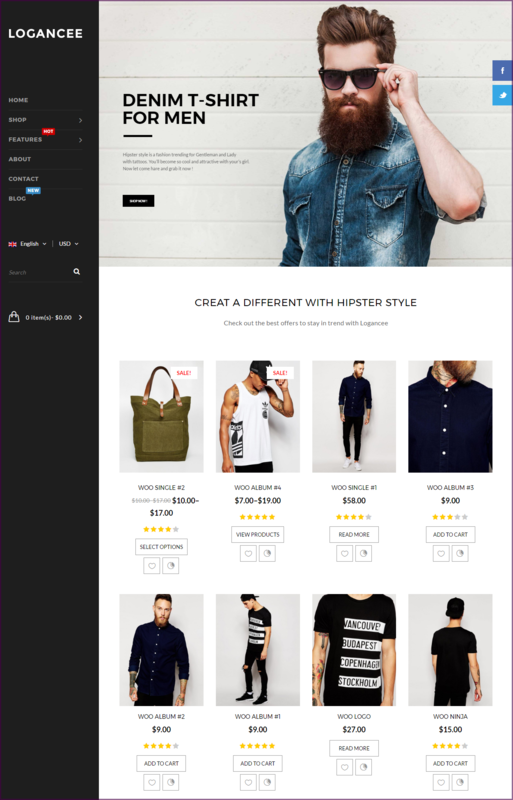 New ecommerce theme for wordpress, theme is designed for all type of online stores. You will get all modern features with the theme and many premium plugins for free. Theme design is fully responsive and mobile friendly. 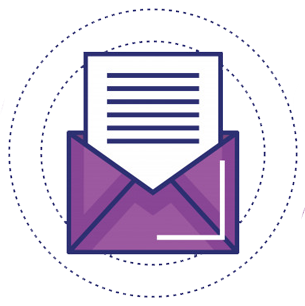 Also include demo content which you can upload on site by just clicking a button. Other key features include responsive header slider, mega menu, and multi languages support. UX Shop wordpress ecommerce theme comes with 4 different layouts; it gives you an option to choose the perfect website design for your online store. Each of them has a different and unique way of display products on homepage. 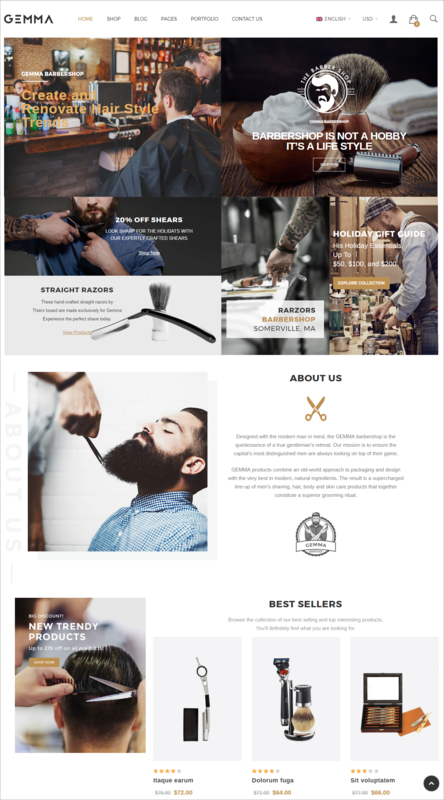 UX Shop theme is a multipurpose theme so it can be used for portfolio, blog, business, finance, freelance, photography website too. Logancee is another multipurpose responsive and fully customizable wordpress theme. Theme has 15+ homepage layout designs & multiple header menu designs to choose from. Theme has powerful theme option penal where you can easily setup website layout and can customize theme to best suit your needs. You get premium plugins like visual composer and resolution slider for free within theme. Alexa WordPress eCommerce theme is perfect for fashion, digital, shoes, furniture and for many other online stores. It comes with 4 different homepage layout designs and responsive layout that works on all devices (computer, laptops, mobiles, tabs etc…). It’s a modern ecommerce theme for wordpress users, has all the key features that you will need to start your first online store. Gemma eCommerce theme has features like mega menu, image slider, page builder, quick product view, wishlist, compare product, product zoom etc. 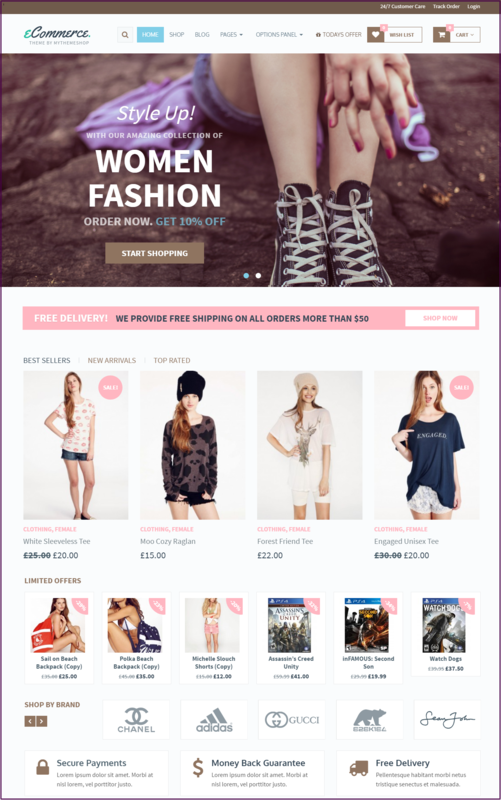 this is the perfect wordpress themes for online fashion stores. You can show brand logos in slider on homepage, can showcase customers’ testimonials, latest news and latest blog post on homepage. These features give a different and effective look to your online store. There is unlimited colors combination for theme header and footer layouts. Theme has page builder plugin which will help you build pages by dragging & dropping section easily. Theme is responsive so your website will work on almost all devices like desktops, laptops, tablets and smartphones. Hi Amar Thakur, Mind-blowing Article. Thanks for sharing. 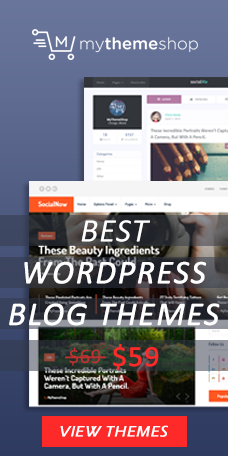 I like to share one more theme which is integrated with WooCommerce, and it is Kosmic WordPress theme. 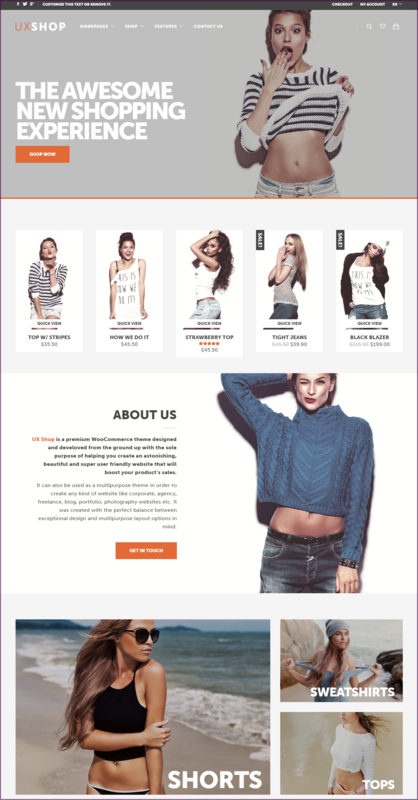 It is a multipurpose theme so using this you can make any kind of online store. This theme is fully responsive, customizable mega menu, widgetized home page and many more.